In our previous article, “How to Add Google Analytics on your WordPress Site,” we recommended the new MonsterInsights plugin (formerly known as Google Analytics for WordPress by Yoast). In this first of a two-part series, we’re going to take a deeper dive into the functionality of MonsterInsights and show you what this amazing plugin offers and how it can make your website tracking easier. MonsterInsights is a plugin that allows you to easily add, customize, and manage the Google Analytics website tracking services on your WordPress site. In a nutshell, it makes tracking your website with Google Analytics simpler. The plugin was originally created by Yoast, the creator of the WordPress SEO plugin, widely regarded as the best WordPress SEO plugin available. The Google Analytics for WordPress plugin by Yoast was recently acquired by Syed Balkhi — creator of the brilliant OptinMonster and WPForms WordPress plugins — and renamed “MonsterInsights”. There are two versions of the MonsterInsights plugin: Free and Pro. Turn on/off different types of tracking with a single click. Visitor metric dashboards and reports within your WordPress admin. Track outbound links or downloads on your site. Anonymize IPs so traffic from countries with stricter privacy regulations can be tracked. Track 404 error pages on your site. Track custom dimensions like pageviews per author. Though the free version of the plugin more than fits the bill for the majority of WordPress site owners, consider the Pro version if you are looking for more customizable reporting data from within your WordPress dashboard. There is even an eCommerce Addon for eCommerce website owners that connects with WooCommerce or Easy Digital Downloads. In our last post we covered how to create a Google Analytics account and install Analytics onto your site via the MonsterInsights plugin. In that post we covered two methods to connect your Google Analytics account to the plugin. The first method is to “authenticate” your Google account within the plugin. The other method is to manually copy and paste your Google Analytics user account number into a field within the plugin. We recommend that you use the first option, “Authenticate with your Google account”. By connecting your account this way, you will be able to access the reports and dashboards features of the plugin. Once you have the plugin installed and your Google Analytics account authenticated, it’s time to configure the plugin for what you want to track. This is done in the “Settings” section. We’re going to run you through the main settings to get you set up at a basic level within the free version of the plugin. The general settings are where you can customize the functionality of the plugin. This is where you determine which Google Analytics profile to track and how you want it to track traffic to your website. TIP: You can hover over the question mark icon next to any setting in the plugin to view an explanation of that setting’s functionality. 1. First you need to tell the plugin which of your Google Analytics profiles should be connected. You may have multiple profiles within your single Google Analytics account, so the plugin needs to be sure which one to pull data from. Once in the General Settings tab, simply use the dropdown and select the appropriate profile you would like to connect. Now let’s configure some settings. 3. Allow Tracking of Anonymous Data: This is not really a tracking option, but rather an option that will allow the plugin to track the themes and plugins you use in order to provide a better user experience. We recommend you check this box. 4. 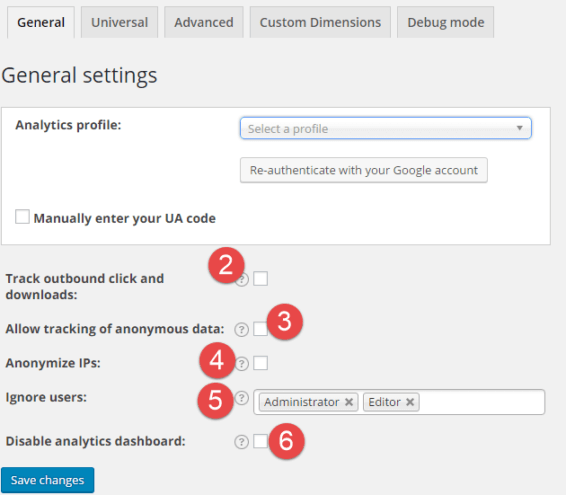 Anonymize IPs: As mentioned above, checking this box will allow Google Analytics to track data from users in countries where privacy restrictions may not allow for data tracking. We recommend you check this box. 5. Ignore Users: This option allows you to add in user types so that they are not tracked when logged in and visiting the site. By default, “Administrator” and “Editor” are included. This option helps you get clean analytics data. After all, you don’t want all the time you or your editors and staff spend on the site to be counted since have to be on the site. We recommend leaving the default settings as is, but some may want to add in “Author” or “Contributor” if they want to further clean their data. 6. Disable Analytics Dashboard: This will turn off the dashboard functionality of the plugin and stop the plugin from showing you the latest analytics data pulled. You can still access all of your data by logging into Google Analytics, but we recommend you leave this box unchecked. A great feature of this plugin is that you can see your website traffic data immediately after logging into your site, and we think you should use it. There are two types of Google Analytics tracking: Universal and Asynchronous. They both refer to the type of tracking code implemented on your site. Universal Analytics is the latest iteration of analytics and it provides you with the option to gather more data about visitors to your site. We always recommend that you use Universal Analytics over the older Asychronous version. 1. 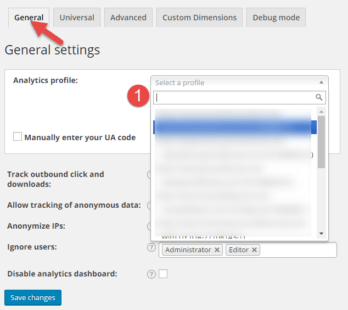 Enable Universal Tracking: This turns on Universal Analytics tracking and we recommend you check this box. 2. Enable Demographics and Interests Reports for Remarketing and Advertising: By checking this box Analytics will be able to pull demographic and interest-related information about your website visitors to give you a better idea about your audience. This information can be used to fuel new content ideas. MonsterInsights has a great explanatory document about how to first enable the Demographics and Interest Reports within the Google Analytics interface. See separate information for multiple links on a page that all have the same destination. For example, if there are two links on the same page that both lead to the Contact Us page, then you see separate click information for each link. See when one page element has multiple destinations. For example, a Search button on your page is likely to lead to multiple destinations. There are several advanced tracking options you can implement with MonsterInsights. Many of these options will likely not be necessary if you are running a straightforward WordPress site, so we are only going to cover the settings you need to know about. You can find additional documentation on these advanced settings in the “Docs” section of MonsterInsights located here. 1. 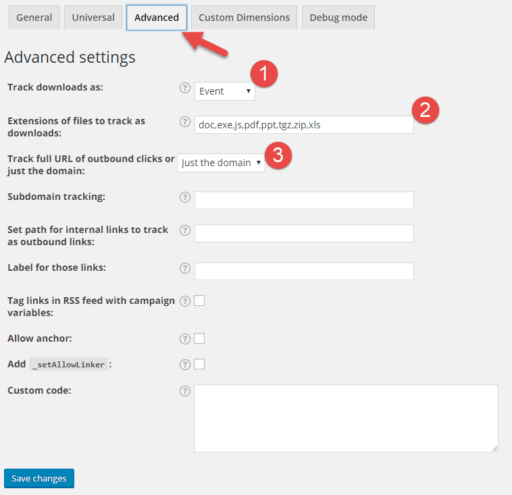 Track Downloads As: This setting allows you to specify how a download on your website is tracked. As mentioned earlier, downloads could be any links to PDFs, .doc files, or even images where clicking on the link results in the download of a file. We recommend leaving this setting as is, otherwise your data may be skewed. If you would like to track these downloads as goals in Google Analytics, we recommend you create a new goal and use “Event” as the goal type rather than changing any settings here. 2. Extensions of Files To Track As Downloads: This is where you can specify the types of files that will count as downloads. Again, we recommend you leave this setting as is since pretty much every major file type that can be downloaded on a site is included. 3. Track Full URL of Outbound Clicks or Just The Domain: This setting controls how links to other sites from your site are tracked. For example, if you have a link to a Wikipedia page in one of your blog posts, Google Analytics can show you how many times that link was clicked and from what page. By default, Analytics will only track the domain (wikipedia.org), but if you change this setting to “Full links” then you will be able to see the full URL of the outbound link. In Google Analytics, you can find this data by going to Behavior >> Site Content >> Content Drilldown. For more information on how to dig deeper into this data, Yoast has an excellent guide here. Don’t be intimidated by some of the configuration settings in the new MonsterInsights plugin. The plugin is designed to be simple to set up with default settings that cover pretty much everything a basic WordPress website would need. 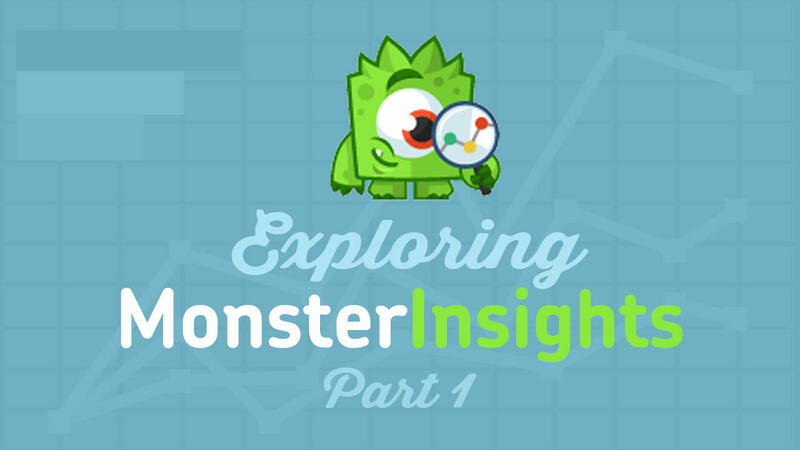 In Part 2 of our MonsterInsights series, we’ll cover the Dashboard and show you how to interpret the data it provides and how to pull specific metrics and dimension data to give you more insight into your website’s performance. Stay tuned, and happy tracking! These are very great tips. I installed GA monstersight and was quite intimidated with all the stuff. This is good guide telling you nicely which setting is what and how it functions. I have never been able to authenticate my google account(don’t know where to find it). This is a great guide, but my MonsterInsights only has 2 tabs – General and Tracking. Is that all that’s offered on the free version? If so, is there anything else I need to do after installing and activating the plugin to start google analytics tracking the pages and posts? Does the FREE version allow tracking ads from Adsense? Or do I need to put the Adsense tracking code directly to my header.php? 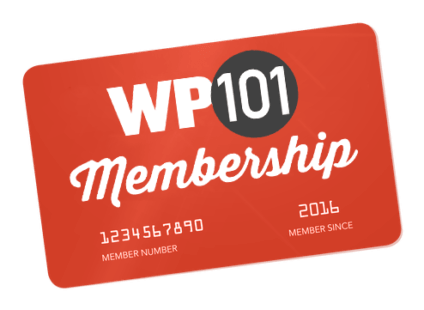 The All-New WordPress 101 for WordPress 5.0 is Here! Which WordPress Host is Right For You? Why Do We Recommend Managed WordPress Hosting? Ready or not, WordPress 5.0 is here! Here’s what you need to know. A curated list of handpicked products and services to help take your WordPress website to the next level.